On Thursday, June 9, 2011 at 12:00 noon, the Greater Newark Conservancy will be hosting a fundraising luncheon to support their job training program for Newark Teens. The Newark Youth Leadership Project (NYLP) seeks to increasing employment and earning potential among Newark youth by providing high school and college students with job training experience, leadership development, exposure to career options in the environmental and horticultural fields; plus options and support for pursuing education after high school. NYLP is beginning its 13th year and has served over 400 participants. 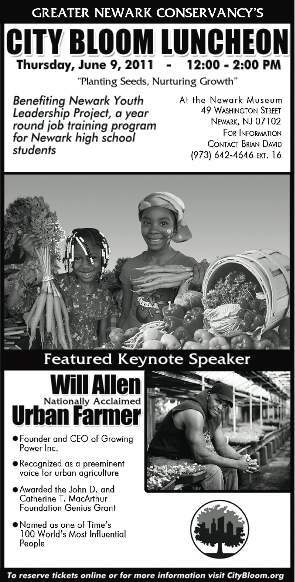 Featured keynote speaker will be Will Allen, founder and CEO of Growing Power Inc., who is a preeminent voice for and practitioner of urban agriculture in America and throughout the world. He was selected to speak to the nation from the White House when First Lady Michelle Obama announced the launching of her “Let’s Move!” initiative to reverse the epidemic of childhood obesity. 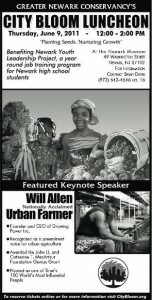 Mr. Allen’s address will inspire Newark youth to put some of their good summer energy into expanding the GNC’s Urban Farming Initiative in Newark. They will have the chance to learn about horticulture and nutrition while helping to expand urban farming in Newark so city residents can have better access to healthy food. Registration begins 11:30 am. Speaker at 1:00 pm. You can view the invitation packet with more details about the event and speaker at the luncheon event page (file too big to post here). 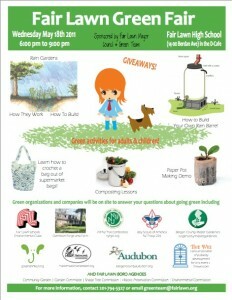 The Fair Lawn Green Fair takes place this Wednesday, May 18. We hope you’ll come out to enjoy all the interesting and nice exhibits. At Fair Lawn’s 2nd Annual Fair Lawn Green Fair on May 18, visitors will tour Fair Lawn High School’s courtyard, see its rain garden and participate in hands-on presentations to learn how easy it is to build beautiful, native plant rain gardens in their own yards or install a rain barrel. Master Gardeners of Bergen County will show residents how to create a pest and odor-free compost bin, or pile, and there will be many other educational and fun activities for families and children. Reusable bags and other items will be given away, free! The Wei is donating a rain barrel to be given away as a door prize. Rain barrel trainers Ari Wei and Adam Fahmi can install the rain barrel for the local resident who takes it home. Pat LaRocco of Fair Lawn’s Rotary Club will demonstrate paper-pot making using soy-ink newspaper eco friendly enough to go straight into the soil along with the starter plants they contain. Ari Wei and Adam Fahmi, boro residents, high school students and rain barrel builders trained through Rutgers’ Water Resources program, will help demonstrate how to make and use mosquito-free rain barrels. One barrel made during the fair will be donated to Fair Lawn’s Community Garden, a town-supported initiative opening to residents this month – who will also have an information table at the fair – and a second rain barrel will be offered as a door prize. Lessons will be given throughout the evening on crocheting satchels with “plarn” strips made from disposable shopping bags. Other fair exhibitors include the boro’s Shade Tree and Historic Preservation Commissions, Bergen County Audubon Society, the NY-NJ Trail Conference, Garretson Forge and Farm, and Green Drinks. Rain gardens are attractive arrangements of native greenery and flowers planted in shallow depressions designed to collect water during a storm and dry out completely within 24-48 hours after it ends. They provide clean water to the planet in two ways: moisture gathered on the leaves of plants evaporates into the atmosphere, and water channeled underground is cleaned by soil as it makes its way down into hidden aquifers carrying water back to streams and lakes. Rain gardens are inexpensive, low-maintenance and provide exceptionally effective, natural cleansing of water that would otherwise enter fresh waterways untreated, along with chemical pollutants such as excess lawn nutrients, pesticides, drops of auto oil and anti-freeze. At the rain barrel demonstration, visitors will learn how to build, install and maintain a rain barrel, which is a modified container placed under a gutter downspout that collects rainwater from a building’s roof. A barrel holds about 50 gallons of water that can be used for a variety of tasks including car washing, lawn and garden watering, and can be especially useful during summer water shortages. Collected rainwater also offers savings on water bills and helps prevent basement flooding. Rain gardens and rain barrels are both important components of a municipality’s stormwater treatment strategy, as they help keep pollutants away from roadside storm drains which funnel water directly into local freshwater rivers and streams. Sponsored by the Fair Lawn Mayor and Council and Fair Lawn Green Team. For more information, contact Kimi Wei at 862-203-8814. What kind of rebates are available? NJCEP & Utilities? Does solar really reduce electric bills? By how much? What are Solar Renewable Energy Certificates (sRECs)? Why should I care? I have heard about Federal Tax Credit (FTC) for solar installations. What are those? How does one apply for the FTC? Does a solar installation really increase the resale value of the property? Current oil spill skimming technology could only collect 3% of the DeepWater Horizon Oil Spill in the Gulf of Mexico. The health of workers was exposed to cancerous toxic, the boats were expensive and pollutive to operate, they could not operate in bad weather (hurricane seaon) they could not operate at night or far away. – Unmanned, no human exposed to toxic. 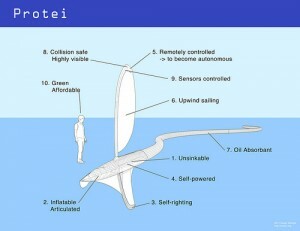 – Green and cheap, sailing upwind capturing oil downwind. – Self-righting, rugged, can operate in hurricane time. – Semi-autonomous : can swarm continuously and far away. 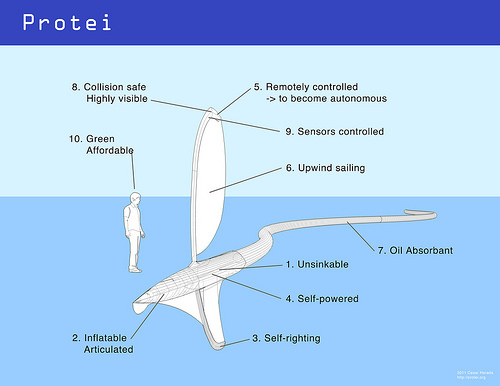 Protei exceeded their Kickstarter funding goal of $27,500 and now are working on a new prototype to clean up waste discarded in oceans. Today is your last chance to oppose anti-Highlands nominees being appointed to the Highlands Council (which is meant to protect the Highlands). Act today – Senate Judiciary Votes on Monday! Richard Vohden, newly elected Freeholder in Sussex County. Both have been outspoken opponents of the Highlands Act and Highland’s DEP rules. Race has publicly encouraged Warren County Freeholders to sue the State to overturn the Act. During his freeholder campaign part of Vohden’s platform was that he is charter member of Highlands Conservation Association. You can help by calling the members of the Senate Judiciary Committee today. Tell the aide who answers the phone, “I would like to ask the Senator to oppose the nominations of Sam Race and Richard Vohden to the New Jersey Highlands Council.” If asked to give your contact information please do so. Somers adds, “Most offensive is the fact that Mr. Race is proposed to take Tracy Carluccio’s public spot on the Council, Freeholder Vohden is proposed to take Tim Dillingham’s public spot on the Council. First, both are elected officials taking public spots on the Council; second .. . the council would have not one enviromentalist on it. Thanks for your interest and phone calls, people! In a major victory for environmental advocates, New York State has ruled that outmoded cooling technology at the Indian Point nuclear power plant kills so many Hudson River fish, and consumes and contaminates so much water, that it violates the federal Clean Water Act.
. . . strongly worded letter from the Department of Environmental Conservation. . . said flatly that Indian Point’s cooling systems, even if modified in a less expensive way proposed by Entergy, “do not and will not comply” with New York’s water quality standards. It said the power plant’s water-intake system kills nearly a billion aquatic organisms a year, including the shortnose sturgeon, an endangered species. The letter also said that radioactive material had polluted the Hudson after leaking into the groundwater.
. . . the cooling system at Indian Point Units 2 and 3 . . . take in enormous volumes of river water . . . and use it to create steam for turbines and to cool the reactors. The water is then pumped back into the Hudson, 20 or 30 degrees hotter. Sucking so much water causes plankton, eggs and larvae to be drawn into the plant’s machinery, or entrained, and the water pressure also causes fish to be trapped, or impinged, against intake screens, the state said.
. . . An Entergy spokesman said that converting Indian Point’s cooling system would cost $1.1 billion and would require shutting both reactors down entirely for 42 weeks.